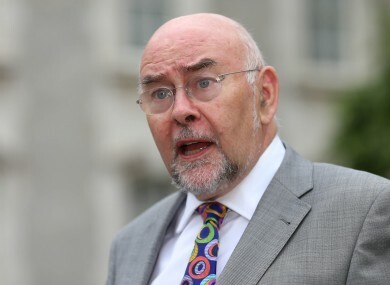 EDUCATION MINISTER RUAIRÍ Quinn has said that the amount of money taken out of the economy in the October budget must be less than the €3.1 billion demanded by the Troika and some within government. Labour TD Quinn was speaking to RTÉ’s This Week programme when he said that he would not know the exact amount he must cut from his own department’s spending until the end of September. The Budget is scheduled for 15 October. A report in the Sunday Business Post today suggests that the government is now set on a budget adjustment of less than the €3.1 billion that has been previously suggested but the coalition parties are split on just how much austerity is implemented. Quinn said today: “I think the figure has to be less than the 3.1 [billion euro] that has been articulated. He said that spending reductions “have to take a holistic view of the entire activities of the government” and said that he anticipated having a firmer idea of what amount needs to cut in the education sector by the end of this month. It has been suggested in recent week that the Department of Education must cut €100 million as part of Budget 2014 but Quinn would not be drawn on specifics. Quinn did say that the controversial Economic Management Council (EMC) – consisting of the Taoiseach, Tánaiste, Finance and Public Expenditure and Reform Ministers – “is absolutely essential” to the working of government. Concerns have been raised by other Cabinet ministers and the opposition about the decisions taken among the four Cabinet members without consultation with other Cabinet colleagues. But Quinn said that the EMC would not be able to function “if it was bigger than the four people there at the moment”. Quinn also said that the process of getting religious orders to pay 50 per cent of €1.4 billion that is needed for redress claims made by victims of residential abuse has been slow as the orders “have not accepted the principle of 50-50″. He said they the orders are short “at least €200m in terms of the amount of money that they were supposed to deliver” under the agreement with the State. “This is a discussion that is not over and as far as I’m concerned will not be over until it is paid,” he said, adding later that negotiations “are of their nature slow and the sense of time on one side is very different to the sense of time that I have on my side”. Email “Ruairí Quinn: 'The budget cut has to be less than €3.1 billion' ”. Feedback on “Ruairí Quinn: 'The budget cut has to be less than €3.1 billion' ”.